Freedom and Flourishing: How does Bhutan beckon? ‘Bold Bhutan Beckons’, by Tim Fischer and Tshering Tashi, was first published in 2009. I almost bought a copy then. I had just written a review article about Bhutan’s gross national happiness (GNH) objective and was naturally interested in Tim Fischer’s views on Bhutan – since he is a fellow Australian and former leader of the National Party. Anyhow, the moment passed and I didn’t think again of buying the book until a couple of weeks ago when I had it in my hand in a bookshop in Thimphu. As soon as I flipped through the pages I knew that I had to read it. In his introduction, Tim Fischer mentions that when he and his friend Tshering Tashi (a businessman and writer who lives in Thimphu) were talking about joint authorship of this book, someone warned him that joint book writing was ‘possibly a guaranteed way to spoil a friendship’. That might have been good advice, but the way Tim and Tshering have written the book seems to have been designed to reduce the potential for conflict. Rather than attempting to write jointly, they have each made separate contributions to the book and have told readers who wrote each chapter. One of the highlights of the book, in my view, is the discussion of Zhabdrung Ngawang Namgyal, whom Tshering describes as the founder and conscience of Bhutan. 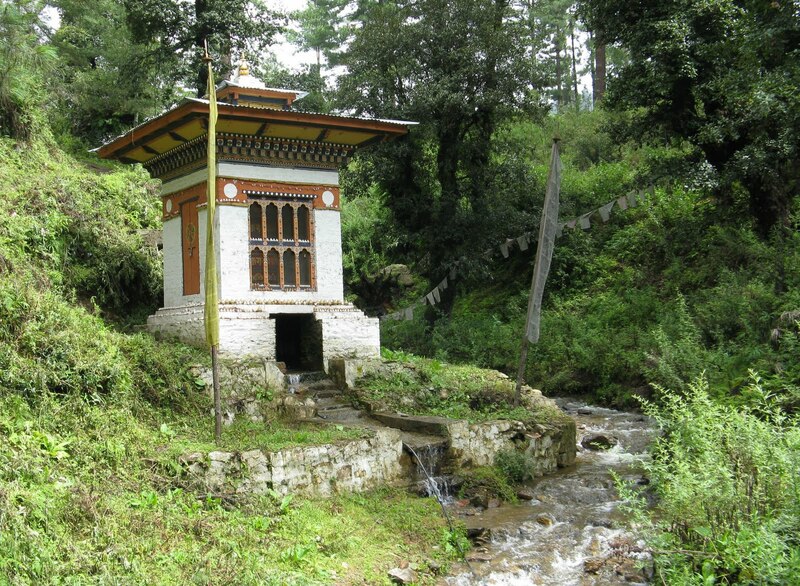 Tim tells the story of how two Jesuits visited Bhutan in 1627, when Zhabdrung was a young king. Zhabdrung offered them hospitality and apparently allowed them to attempt to convert local people to Christianity. Zhabdrung might have been confident that the Jesuit’s proselytising efforts would be unsuccessful, but he also claimed to be respectful of individual liberty in other contexts. Tshering notes that many times the king told his lamas that ‘though they are most submissive, everyone is his own master to do what he likes’ (p 25). It is not clear from the book, however, whether Zhabdrung’s acknowledgement that everyone is his own master extended to their use of what he described as ‘the evil, stinking, poisonous weed named tobacco’ (p 29). Zhabdrung stressed the virtues of perseverance and self-discipline. He quoted his teacher who said: ‘If you do not work hard you will not find sweet food. If you do not know the taste of suffering, you will not know the taste of happiness’. Zhabdrung’s achievements include the building of seven dzongs (combining the functions of fortresses and monasteries) built in strategic locations in different parts of the country. 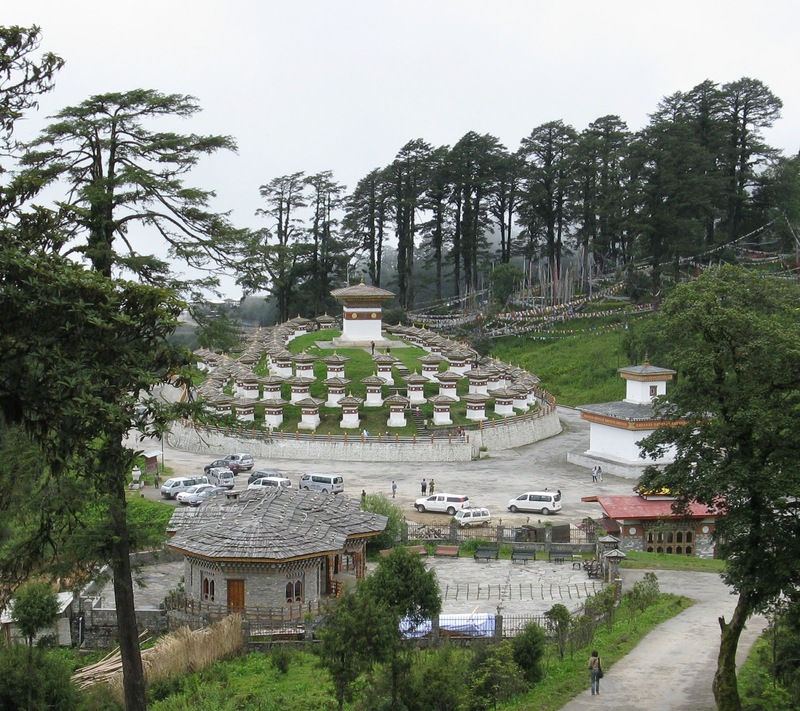 The first was built in 1629 at Simtokha, about 5 km south of Thimphu (the capital city) on the road to Paro and Phuentsholing. 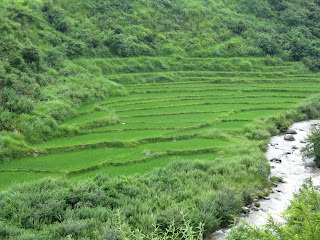 The photo below was taken from the road from Thimphu to Punakha. 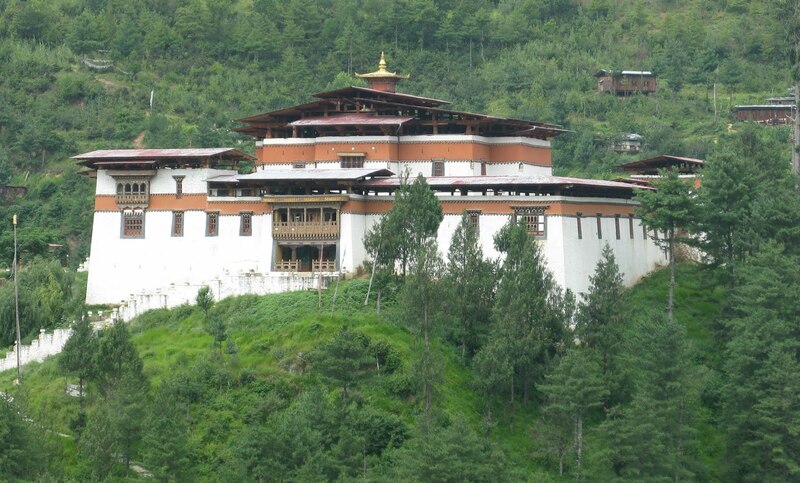 The Punakha dzong, shown in my last post, was also built by Zhabdrung. Since I have already distracted myself away from reviewing the book, this might be an appropriate opportunity to present some photos I took on the road from Thimphu to Punakha. This is my guide, Nado Richen, who was most helpful. After my return to Australia, Nado emailed a fact sheet to me to ensure that I understood what he had been saying. Nado was concerned that his command of English was not strong enough to answer some of my questions. 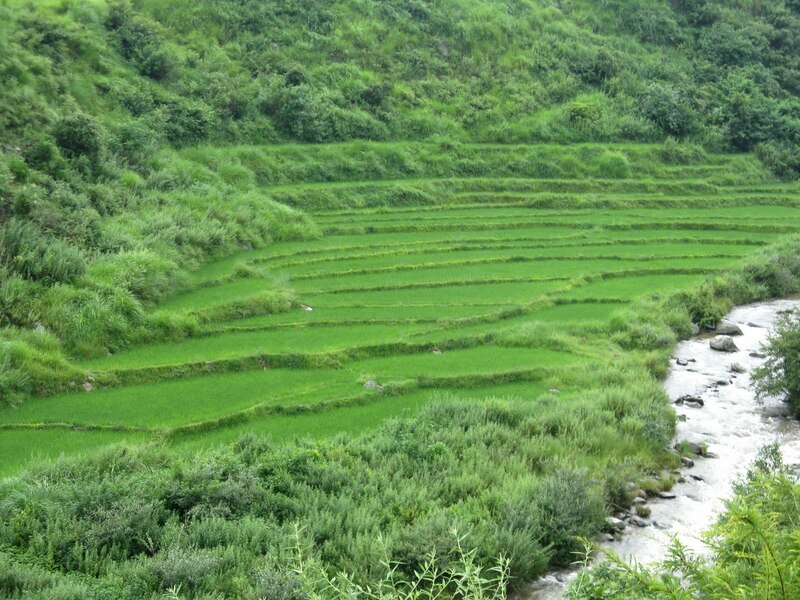 Bhutan is very keen on use of hydro power - and not just for electricity generation. This photo shows a water-powered prayer wheel. These are the Druk Wangyal Chortens -108 stupas at Dochula pass (3050m) a popular place, with panoramic views. Stupas are spiritual monuments offering observers a direct experience of inherent wakefulness and dignity.These stupas were built by the eldest Queen Mother, Her Majesty Ashi Dorji Wangmo Wangchuk, in honor of soldiers who fought in the 2003 low-intensity border conflict to expel Indian militants. The Indian militants had been threatening Bhutanese sovereignty by using camps in Bhutan as a base to pursue their revolutionary aims in India. Tshering Tashi wrote a chapter discussing the conflict in ‘Bold Bhutan Beckons’. 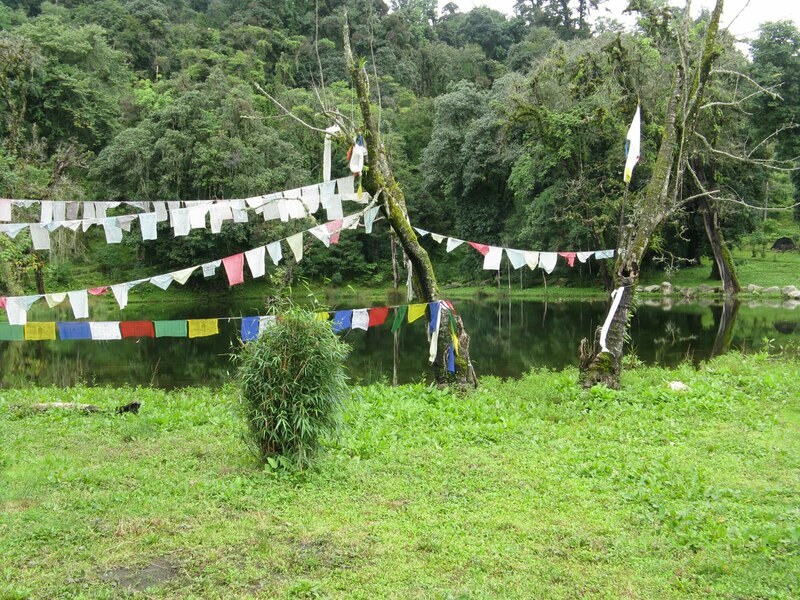 Prayer flags at a lake in the Royal Botanical Park at Lamperi. This truck is typical of those passed on the road from Thimphu to Punakha. The prayer wheel in Nado’s car is shown in the foreground and is reflected in the windscreen. Some cows on the road near Punakha. Now, where was I before I interrupted myself? 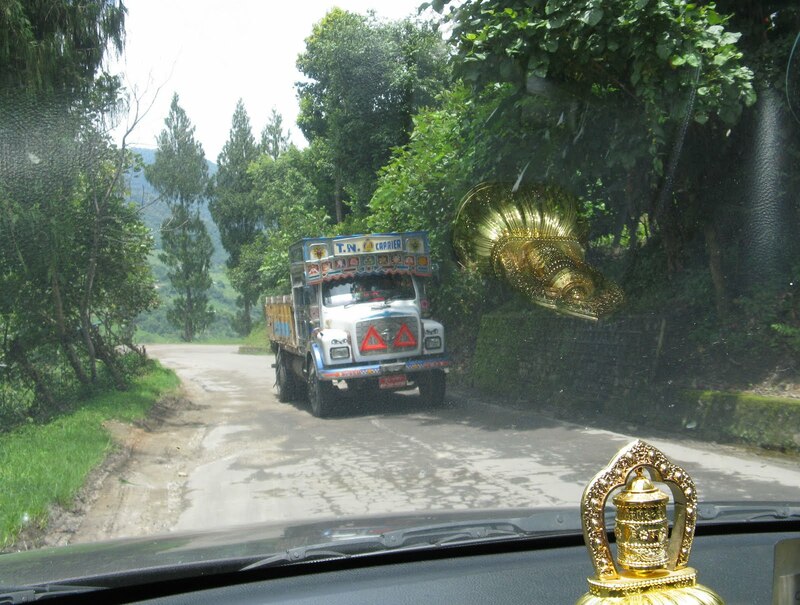 I was writing about Tim Fischer’s account of road building in Bhutan in the 1960s. Tim was helped in writing this story by his discussions with Hardy Pradhan, an Australian engineer who worked on the first roads in Bhutan. The roads were built with the help of Indian expertise but the labour involved was largely a national effort by Bhutanese people. All Bhutanese were apparently expected to work on the project for 33 days. Another highlight of the book, for me, was Tshering’s account of his meeting with Tsham Penjor, whom he describes as the great hermit. I know little about hermits, but some aspects of the story did not surprise me. I had expected that any person who had spent most of his life in solitary meditation would have little attachment to material things. The part of the story that surprised me is that despite his solitary life, Tsham is apparently a warm, hospitable and happy person. Tshering argues that the pursuit of materialism and the desire to be admired respected and noticed brings with it a great deal of uncertainty. He suggests that ‘it is in the simplicity of people like Tsham Penjor that the truth and greatness really live’. Through the example of his life Tsham ‘reminds us that the mountains have the power to liberate humans from this uncertainty’ (p 78). Is that why Bhutan beckons? Is it the challenge to spend more time on our mountains – geographical or metaphorical - aiming to live in harmony with nature and our neighbours and to seek goodness and enlightenment? That seems to me to be an important part of the story. Tim Fischer has another important part of the story in his suggestion that Bhutan acts as a magnet because its culture, customs and traditions survive to this day in a careful blend with modernity (p 19). For me, the main attraction is that the Bhutanese people are taking charge of the blending process themselves, individually and collectively, with the aim of building a happier society. In thanking me for this review, Tshering Tashi has reminded me that Bhutan may also be the last bastian for many endangered animals. He has written about this in the book. He has also written an article in Kuensel about the blue bear, which is believed to be extinct. I neglected to mention that my main reason for visiting Bhutan was to attend a conference on 'Happiness and Economic Development'. Some of the conference presentations are now available on this site. What a fantastic trip this must of been, and how nice it was of the guide to e-mail to see how he did. I love all your photo's, and the architecture of the building are magnificent. Thanks Mags. 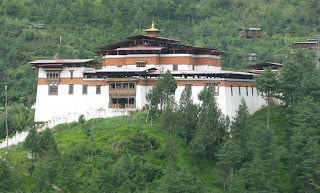 I was interested in Bhutan before I went there, but I am now fascinated by the place. Winton, I've still to catch up with your Bhutan experience, meaning I've not read your other posts on it, but I forced myself to read this post. Oh, now, please don't be offended by my use of the word 'forced'. 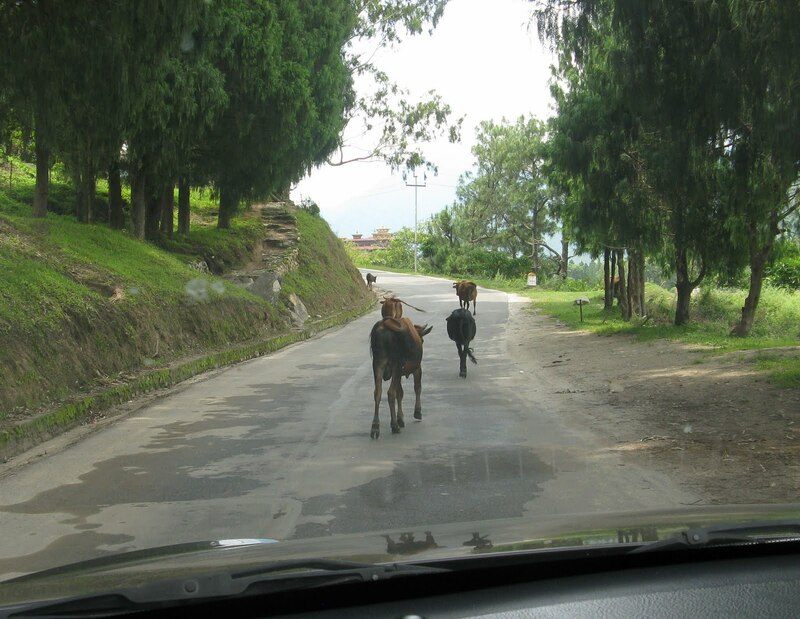 It means here that although I felt I had other things to do, I decided to read all of the post because I wanted to know especially how Bhutan had beckoned you (apart from being invited to deliver a paper at a conference). Which brings me to the thing I most wanted to comment on - the mountains - on earth and in our minds. I'm glad you were smiling at the end of your comment. I think I know what you mean about the hard work. I wonder whether it would be easier if we didn't have to deal with the distractions of modern life. My guess is that it wouldn't be much easier. 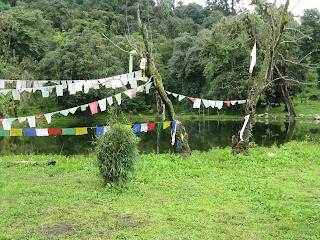 I understand that most people in Bhutan spend little time meditating even though it is part of their cultural heritage. Modern life offers many apparent 'quick fixes' (forms of relief) which are often detours that can be exhausting and frustrating, I think. Effectively, it keeps us in the same cycle of stress and relief instead of helping us make a clean break. I think you may be right about the ongoing mindfulness, TBT. But that would probably be easier with a rural life-style. Apparently meditation classes are now being run in schools in Bhutan to help children develop the habit of meditating. I think that program was introduced as a result of their GNH survey which shoes that time spent meditating was not as great as hoped. My response would have made more sense if I had noted that there has been a lot of migration from rural to urban areas in Bhutan in recent years (as in many other countries). I could also have typed shows rather than shoes.